A year after the war in Gaza, the guns are relatively quiet, most of the time. A de facto ceasefire between Israel and Hamas has held. But the conflict is still there, and if anything it is keener. Until its fundamentals are tackled - and there's no sign of that happening - another big outbreak of violence between the two sides will only ever be one serious incident away. Between 1120 and 1135 on 27 December 2008 the Israeli air force attacked the Arafat City police headquarters in Gaza, and at least three other police stations. It was the start of an offensive that lasted for three weeks. The Israeli army says it killed 1,166 Palestinians. The Palestinian health ministry's count is about 1,500. B'Tselem, the Israeli human rights group, says that Israel killed 1,387 Palestinians during the war; more than half of them were civilians, and 252 of them were children. Israeli attacks also did huge physical damage in Gaza to homes, businesses and the rest of the infrastructure of daily life. Nine Israelis, including three civilians, were killed by Palestinian fire. Four others, all Israeli soldiers, were killed by their own side. Hamas rockets did little physical damage in Israel. What happened is still controversial. Israel and Hamas disagree on every point - why it started, how it started and what has happened since - except that it was the latest battle in a very long war. Twelve months on, Palestinian civilians in Gaza continue to suffer grievously. Israel has kept up its blockade. It allows in only the barest essentials, which are supplemented by whatever smugglers can bring in through tunnels from Egypt. The Egyptians, no friends of Hamas, also put heavy restrictions on what can pass through their border with Gaza. They are building an underground barrier to stop the tunnels under their border as well. But Israel, legally speaking, still has the responsibilities of an occupying power, even though it no longer has a permanent military presence in Gaza. These responsibilities include ensuring the welfare of the population, allowing the functioning of medical services, and maintaining respect for private property. It has been impossible to repair war damage because Israel has let in only 41 truckloads of construction materials since January 2009, according to a new report from the leading European humanitarian and human rights groups operating in Gaza. They say that thousands of truckloads are needed and that the blockade should be lifted. Israel insists that concrete, piping, glass, steel and all the rest could be used for military purposes by Hamas. Jeremy Hobbs, from Oxfam, called it "a blockade that punishes everybody living there for the acts of a few". The same aid groups also accused world powers of abandoning Gaza, of simply wringing their hands about what is happening. European diplomats from Israel's allies will speak on condition of anonymity about their concern about what they call "the slow progress of degradation in living standards" in Gaza. Enough food comes in to make sure that people don't starve, though they have a limited diet. But the winter will be hard. In November only 275 aid trucks were allowed in, the lowest number since the crisis began, according to European diplomats. This month the Gaza power plant has been running at 62% of capacity; 90% of Gazans suffer power cuts of four to six hours a day. Lack of clean water is a major health issue. Aid agencies say that diarrhoea kills many young children and they have linked contaminated ground water to congenital heart defects in new-born babies. The violence and dislocation has also caused a dramatic increase in what doctors call psycho-social disorders. For children, who are especially hard-hit, that means bedwetting, nightmares, depression and aggression. All of this is already having a political effect. The UN says Gazans, especially young people, are being radicalised. Hamas scored when the secular nationalists of the PLO couldn't make life any better. Now the UN fears that the next set of answers for Gaza's young - half the population are children - is coming from jihadists who are sympathetic to Al Qaeda. Israel should be worried. Dealing with the PLO and with Hamas has been hard enough. Israeli politicians stoutly defend what was done in Gaza a year ago. Most Israelis still consider it necessary defensive action, forced on them by years of rocket attacks. The Israeli government has been campaigning against the UN's official report into violations of international humanitarian law in Gaza, which was published in September. Richard Goldstone, a respected South African judge and war crimes prosecutor, led the team that wrote the report. Mr Goldstone is Jewish with strong Zionist credentials. That has not stopped the Israeli government from condemning his report as biased. The Goldstone report said that there was evidence that both Israel and Hamas committed crimes against humanity during those three weeks at the turn of the year. Israel says it worked very hard to protect Palestinian civilians and insists its soldiers respected the law. Yet there is also a nervousness about what has been done to Israel's image. There was outrage in Israel when a British judge issued a warrant for the arrest of the former Israeli Foreign Minister Tzipi Livni, who was in power during the Gaza war. It was revoked when it became clear Ms Livni would not be visiting the UK. The Goldstone report said that states had a duty under international law "to investigate allegations of violations" by Israel or Hamas. One consequence of what happened is that Israeli leaders need to think hard before they travel abroad. Some Israeli analysts see this as another sign of what they call the "de-legitimisation" of their country by hostile and influential critics, which they believe is designed to erode its position as a Jewish state. It is a fact though that Israeli citizens who live within rocket range of Gaza have had a much quieter and easier time of it in 2009 than for years. Israeli generals and politicians insist that the Gaza war means that their army is once again feared, in a way that it wasn't after Lebanese Hezbollah guerrillas fought it to a standstill in 2006. 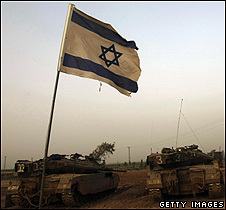 It is also a fact that Gaza is still one of the major flashpoints in the conflict between Israel and the Palestinians. Hopes that US President Barack Obama could conjure some diplomatic magic in 2009 have disappeared. It is hard to see what can change the game. The split between the two main Palestinian factions, Hamas and Fatah, looks as if it will continue. Negotiations about a prisoner exchange could help. Hamas has one Israeli captive, a soldier called Gilad Shalit, who has been in their hands since 2006. A German negotiator is shuttling between Gaza and Israel, trying to arrange to exchange Sgt Shalit for hundreds of Palestinian prisoners. So far, Israel has not wanted to release as many as Hamas has been demanding. If a deal is made, European diplomats are hoping a relaxation of the blockade could follow. But the Israeli government will be criticised at home for releasing Palestinians and giving Hamas a victory. Opening the borders might feel too much like giving them another. What always amazes me about Gaza is that despite the difficulty of life there, it is never hard to find energetic people whose human spirit burns very bright. But there is not much to look forward to on either side of Gaza's border with Israel in 2010. The year will be full of challenges and dangers.